Luminescence Thermometry: Methods, Materials, and Applications presents the state-of-the art applications of luminescence thermometry, giving a detailed explanation of luminescence spectroscopic schemes for the read-out of temperature, while also describing the diverse materials that are capable of sensing temperature via luminescence. Chapters cover the fundamentals of temperature, traditional thermometers and their figures of merit, a concise description of optical thermometry methods, luminescence and instrumentation, and an explanation of the ways in which increases in temperature quench luminescence. Additional sections focus on materials utilized for luminescence thermometry and the broad range of applications for luminescence thermometry, including temperature measurement at the nanoscale and the application of multifunctional luminescent materials. 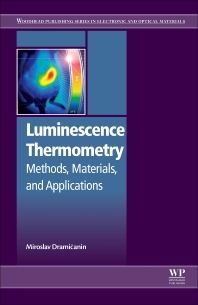 This book is a world of knowledge regarding Luminescence Thermometry. It completely covers the topic, and everything is explained in a detail. The spectroscopic practices, I have not found in other books or articles, that any experimentalist must follow were of greatest value to me. Overall, I highly recommend this book. Dr. Miroslav Dramicanin is currently a research professor at Vinca Institute of Nuclear Science at the University of Belgrade. He also acts as a full professor at the faculty of physics and the head of the Laboratory for Radiation Physics and Chemistry where he studies luminescent materials. His current project involves studying materials of reduced dimensions for efficient light harvesting and energy conversion. He has served as chairman and on the organizing committee of internal conferences for optical materials, and as editor of multiple international conference proceedings. He has authored more than 190 scientific papers.